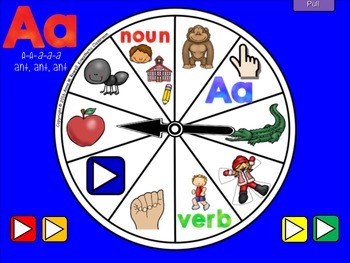 SMARTBoard Lesson: Alphabet Spinners - Letter Sounds - Move Your Body! 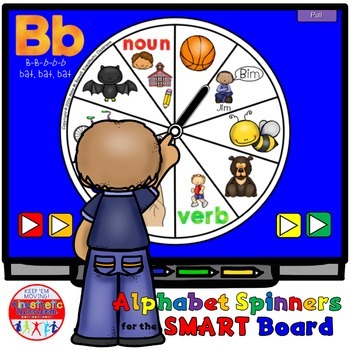 Here are some fun and exciting new Alphabet Spinners for your SMART Board that will get your kids up and moving while they are learning about their letters and letter sounds! This set contains 30 alphabet spinners. There is one spinner for each of the letters, and there are 4 additional spinners that help review all letters at once. Finally, the last page of the file contains links to TWENTY-ONE terrific alphabet song videos! 2. Say your B name (Replace first letter in name with B) You could have fun with it and have the kids shake hands with a neighbor and introduce themselves with their new names. 2. Spin the first spinner. If you land on a MOVE YOUR BODY space, spin the bottom spinner to decide on a move.